Tre Thomas and Caleb Smith celebrate vs. SJSU. Credit: D. Ross Cameron, USA TODAY Sports. Hard work sure does pay off. 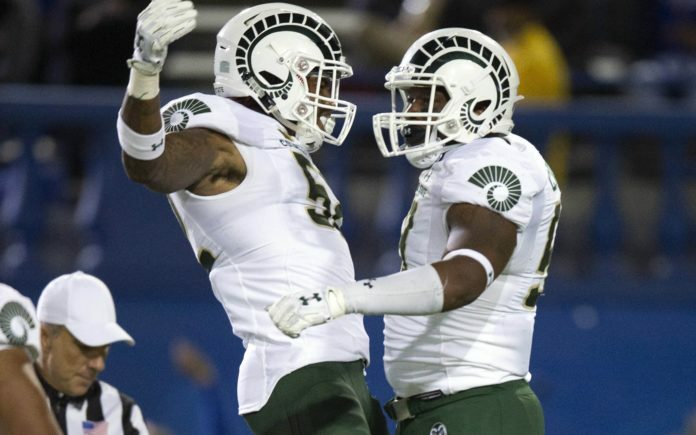 Colorado State defensive lineman Caleb Smith’s recent play has embodied that concept. The redshirt senior transferred to CSU before the 2015 season and didn’t end up seeing the field until 2017. Even then, Smith recorded only seven total tackles over the duration of the season. However, the 2018 season provides a completely different story in terms of Smith’s impact. The defensive lineman has collected 23 tackles in six games played, including seven tackles in two of the Rams’ last three games. Smith’s newfound ability to be a defensive difference maker was highlighted in CSU’s thrilling 20-18 homecoming victory over the New Mexico Lobos. The defensive lineman was evidently on a mission from the very first whistle. Colorado State won the coin toss and deferred, handing the ball to New Mexico to kick off the action. Smith brought down UNM running back Tyrone Owens on the very first play from scrimmage for no gain. The next play, Smith forced a key fumble that set the tone defensively for the Rams on Saturday afternoon. Linebacker Tre Thomas recovered the ball at the Lobos’ 12-yard line. CSU reached pay dirt two plays later and only a little more than one minute into the game. Smith’s seven total tackles against the Lobos were the third-most on the team, adding a sack and two tackles for loss on his big day. The Rams’ defense has appeared to turn a corner over the last two games. The Lobos averaged 42.2 points per game heading into the contest but CSU held New Mexico to a mere 18 points. And other than a gruesome third quarter against San Jose State, the Rams’ defense didn’t allow a point in that game, either. Their certain surge was completely unexpected considering how CSU performed defensively over the first five games of the season. Smith emerging exemplifies the overall improvements throughout the defensive unit. Though the defensive lineman’s breakout performances weren’t anticipated by many, they came as no surprise to Smith. A shift in mentality and continuing to put his head down and grind was the antidote for the redshirt senior’s struggles. Along with the depth Smith provides, he brings a level of maturity that has become very beneficial for underclassmen as well as the overall defensive chemistry. Smith may not have a lot of playing experience prior to this season, but it is his fourth year in the program. He’s been through it all in practice, so when his time came to produce in games, Smith didn’t bat an eye. It is also worth noting the fact that Smith is a senior and this is his last shot to make a difference at the collegiate, or most likely any level of football. Players often feel significantly more obligated to step up once their final season is upon them. That definitely could be said for Smith. Bobo sure seems to believe that. Regardless of what exactly initiated Smith’s current level of play, it goes without question that things have clicked for the defensive lineman. 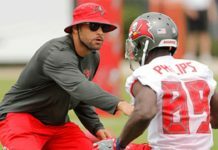 Smith stepping into the starting role lately while focusing on “pass rush,” “technique,” and “everything coming together” in practice as things that have led to his success. Well, if everything remains together on the field for the senior Smith moving forward, the Rams will reap the benefits, similar to how they have over the past few games.